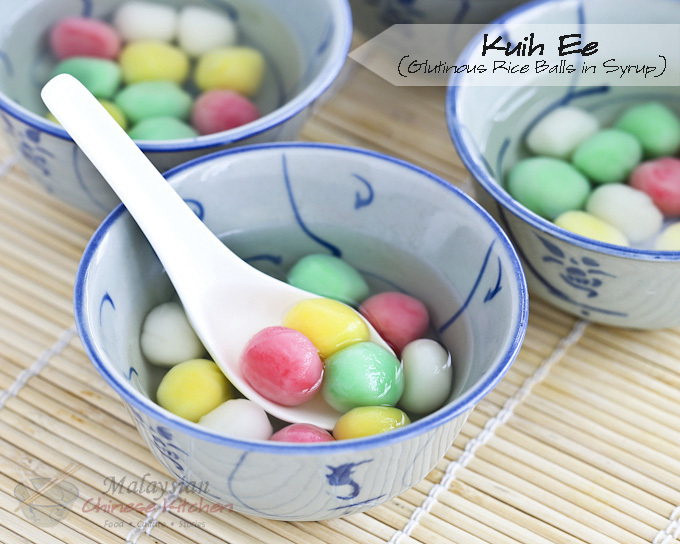 Kuih Ee is a dessert of glutinous rice balls in syrup eaten as a symbol of unity and togetherness during Tang Chek, weddings, birthdays, and the Chinese New Year. 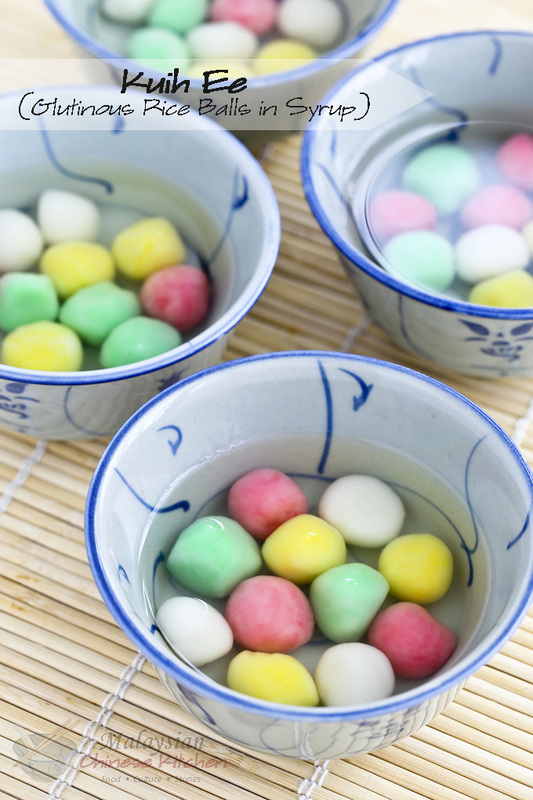 The Kuih Ee or tang yuan dish is a potent symbol of unity and togetherness for Malaysian Chinese families. Separated from China, and today further spread across the world in the modern diaspora, no dish represents the yearning to form the familial circle like this one does. The very name of the dish describes a circle, and echoes the round dinner tables that are normally used for family meals. The Hokkiens used to exclaim, “Chit ke ho, ho, ee, ee” (一家和和圓圓), meaning one family in harmony and unity, just before eating this treat. 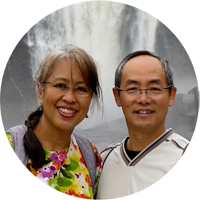 The year end holidays are a most treasured time for us now that both sons are in college. Although this dish is popularly eaten during Tang Chek (Winter Solstice Festival), it is also served during weddings, birthdays, and the Chinese New Year when families get together. As such, we saw it fitting to celebrate the recent New Year with this fun and colorful dessert after a hearty “steam boat” (a.k.a “hot pot”) dinner. I enlisted the help of my grown sons to help me roll the balls as you will see in the video. It was fun and worked out really well as each person rolled a different colored dough. Otherwise, I would have had to wash my hands after working on each color. There is also cultural significance in having the family roll the dough together to emphasize unity. In my growing up years, I only knew of plain, tiny Kuih Ee without filling. It was only later that I found out about the filled ones. The filling can be either black sesame seed, lotus seed, or red bean paste. I have a recipe on my other blog, Roti n Rice for Tang Yuan with Red Bean Paste Filling. Do check it out. In Malaysia, pandan leaves are indispensable in the kitchen. It is used to flavor all kinds of dishes, particularly desserts. In this recipe, I combined it with ginger to infuse the syrup with a sweet floral and warm fragrance. Combine 2 cups (480ml) water, ginger, pandan leaves, and sugar in a medium sized saucepan. Bring it to a boil. Reduce heat and allow it to simmer for 5 minutes. Turn off heat and set it aside. Place glutinous rice flour in a large bowl. Pour ½ cup (120ml) water over flour and mix with a spatula until a soft dough forms. If it is too sticky, add just a little more flour. Knead for 2 to 3 minute until dough is smooth. Divide dough into 4 equal portions. Set aside one portion for white balls. Add 2 to 3 drops of red food coloring to one portion of the dough. Knead dough until color is even. Repeat with yellow and green colors. Do wash your hands between each color so as not to get the colors mixed. Pinch a tiny amount of dough and roll between your palms to form a smooth tiny ball. Place on a plastic plate or a plate lined with plastic wrap to prevent sticking. Repeat with all remaining dough. You should get about 8 to 10 tiny balls for each color of dough. Bring a medium sized pot of water to boil. Gently drop the glutinous rice balls into the water. Let them cook for about 2 to 3 minutes, depending on their size. They should float when cooked. Remove with a metal strainer. Divide the cooked glutinous rice balls into 4 bowls. Pour enough syrup into each bowl to cover the glutinous rice balls. This is exactly how my mom taught me to make our “Kueh Ee” and we still do it this way until this very day. They are one of my family’s favourites. The colored balls are a must because they make it look so festive. What I also really miss is the “Kee Yah Kueh” which was some kind of chilled yellow colored pudding made with lye water, cut into cubes and then served with dark palm sugar. So yummy. If you have a good recipe for that, please do post it. I’ve been looking far and wide for a good recipe but most don’t come out the way I remember it in terms of taste or texture. It must have the lye water taste and be a bit chewy almost as if they are made with glutinuous rice flour. Thanks. The bag should be labeled as glutinous rice flour and not just rice flour.